Gladys Irene (Magee) Small, 90, of Vineyard Haven, died on August 30, 2018, at the Martha’s Vineyard Hospital after a brief illness. She was a resilient, kind, gracious, and loving person, and she will be greatly missed by her family and friends. 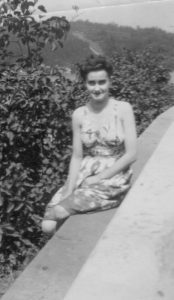 Gladys was born in Coles Island, New Brunswick, Canada, on Sept. 30, 1927, to John and Margaret Small. She came to Martha’s Vineyard in 1945 with her former husband, the late Sterling Magee, with whom she had three children: Carol Magee, William Magee, and Nola Mavro (husband Richard). Gladys was family-oriented, and she was especially good with children. In addition to raising her children and helping to raise her grandson, Gladys loved to read, was an expert seamstress, a member of the American Sewing Guild, and made everything from adult and children’s clothes and dance costumes to drapes and upholstered furniture. She knitted beautiful, intricate sweaters, and was interested in other crafts and homemaking arts, including designing and making sculptured lampshades, as well as cooking and canning, for which she took classes with the 4-H Extension Service. She particularly loved picking beach plums and grapes and making them into jelly. Through the years, Gladys also worked as a retail clerk at Shirley’s Hardware, Lillian’s Clothing Store, Mosher Photo Service, and LeBaron’s of Martha’s Vineyard, as well as for the Welch family at their various stores. She was known for her integrity and reliability, and made many friends. Gladys was the grandmother of Timothy Mavro (wife Kandace) and great-grandmother of their children, Lennox and Ethan Mavro, who were the spark of her later years. Gladys was the sister of Edward Small (wife Audrey), Margaret McKay (husband Robert) and Glendon Small. Gladys was predeceased by her sister, Florence Bater and her brother, Arthur Small and leaves many nieces and nephews. A graveside service was held in the Oak Grove Cemetery in Vineyard Haven on Sept. 5, 2018.